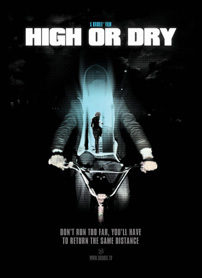 High or Dry, an independently produced low-budget video documentary, scheduled to play sold-out sessions at last year’s Melbourne International Film Festival (MIFF) only to be pulled by the filmmaker Brodie Higgs at late notice, doesn’t lack for provocation. Not that it can afford to when a majority of its screen time showcases Mark, a 29-year-old musician descending back into heroin addiction. If the letdown of the film’s non-premiere at MIFF equates in its anti-climax to a testimonial where the guest of honour fails to show, it has also, during the intervening months, served to bolster a fugitive reputation deserving of the film’s despairing subject matter. Habit here stimulates a series of rap sessions that are condensed into the film’s curious triangulation of twenty-something share-house participants. They include Rachael, Mark’s long suffering girlfriend, and Erin, a fellow user Mark has, merely by virtue of his own tortured musical abilities, exposed even more directly to the drug. The other crucial figure prevalent in proceedings is the filmmaker. His presence, contained for the main part behind a neutral camera, rarely goes unnoticed. Indeed, the success of High or Dry rests almost entirely upon the chemistry Higgs shares with Mark. Theirs is an unflagging partnership founded on a singular commitment seldom rivalled by anyone else in the film. Perhaps because of this, Rachael mostly finds herself displaced to the sidelines. Given the confined prism the movie both depicts and instates around the absorbed Mark, the viewer may, on occasion, wish to join her there. In many ways, Mark is an inmate, the camera his holding pen. Just as Higgs’ cinéma vérité approach occasions something close to oratorical therapy the exchanges with Mark play out often as confessionals. “Do you think you’re capable of looking after yourself?”, the filmmaker asks. “I don’t know”, answers the appropriately devastated Mark. This genuine glimpse of humility, furthermore, proves telling in light of Mark’s admission that he feels free of the “sickness”. He is not, however, free of time; itself a force whose pressing torpor in High or Dry is felt with far greater force than the narcotic melancholy it superficially inspires. As Mark makes mention, the junkie’s life is wasted on the prospect of waiting: To get high, to get off, to get well and, to sum up, replicate all over again. Higgs, to his credit, spares us scenes that drag on into tedious stretches, even while High or Dry, as a reflection of ruined life, comes to represent one. Parts counsellor, priest and sounding board, Higgs, whenever possible, prompts Mark to discuss his life – something he has no trouble with. Talking heads don’t necessitate terra incognita for this documentary, although Higgs’ observational opening, with its poetic context, remains an interesting ploy the film revisits all too infrequently. High or Dry commences with the fixed swirling night view of a windshield as it passes beneath ghostly trees. Major keys of a piano are struck with grave conviction. The film then cuts to footage of smack dealers outside a video arcade on Russell Street, Melbourne, where they await the night’s business. The faces of the young Asian men are blanked out by a kind of black graphic presumably imposed in post-production to protect their identities. High or Dry, however, is less concerned with face value than it is with the cost of stripping it bare. “I’ve almost whacked myself sober”, Mark says, eyes spooling inside a jaundiced skull by way of casual introduction. Having been hooked on heroin for the past eight years, he is nearing the statistical danger point of a likely overdose. Doses of prescribed Deloxine in between amplify rather than negate Mark’s doomed sense of awareness. That said, from the moment Mark opens his mouth, he presents as a performer. Language and gestures are stylised for effect; perhaps his lifestyle, too. Arms tracked badly, he nonchalantly brandishes a syringe in one hand, like it might be an unlit cigarette. Shirt sleeve rolled up, Mark refers to one of his veins, now reduced to a puncture wound, as “pretty faithful”. As he discusses his habit and the habit of kicking heroin (he’s using speed this time), he strikes – perhaps because of Higgs’ scrutiny – a self-righteous tone. “I wake up knowing that I’m better off enduring the sharp ache of recovery than the dull ache of continually using”, he admits to Higgs, who has begun to entertain the first of his many roles – this time as the investigative journalist. By filming in the first person, Higgs sacrifices objectivity for a familiarity more commonly associated with what Frederick Wiseman called the “reality fiction”. Nothing assembled on screen is beyond calculation. Nor can it be when the camera invites much more of the human subject than the meagre facility of recording it. Neglecting to define the rules of engagement, High or Dry sets about demystifying the daily grind of an average middle-class Melbourne-based drug user, despite rarely venturing outside the same house (presumably located in the Inner North). Higgs also omits capturing crucial aspects of Mark, and later Erin’s, livelihoods not associated with their addiction. In doing so, the world they inhabit decreases into microcosm while the filmmaker’s immediate influence increases. “It gives you a sense of omnipotence”, Stanley Kubrick once described directing to critic Eugene Archer, adding that it’s “one of the most exciting things you can find without being under the influence of drugs”. Despite playing the viewer’s proxy – what’s more, at close proximity to his close friends getting baked – Higgs is most certainly the only person who revels in the freedom afforded his ubiquity in High or Dry. Like Jonathan Caouette in Tarnation (2003) or, for that matter, L. M. Kit Carson’s title character in David Holzman’s Diary (Jim McBride, 1967), the challenge for the artist is to outmanœuver reality while locked firmly in its embrace. (McBride’s movie, by its photograph-audio assisted twist, remains, of the three, the only one to break down the second wall and reach beyond the third.) Just as Michael Haneke’s Caché (Hidden, 2005) expands upon the nightmarish (snuff) film Anne Laurent (Juliette Binoche) inadvertently auditions for in Code Unknown (2000) by implicating the viewer in its very making as he does of her entrapment, High or Dry similarly reduces the world that exists inside the frame to the point of incarceration on either side of it. The arrival of Erin, Mark’s forlorn friend in the film, offers some respite. Attractive in an almost apologetic manner, the softly spoken Erin, who sports a Bananas in Pyjamas t-shirt, copes with addiction by charting the days she fixes as a matter of routine in her diary. “I honestly feel at this point in time that this is going to be a life long issue for me”, she admits. A month later, after a phone conversation with her father, her truths soon become half-truths and counselling beckons. Higgs is no less prone to intervene while Erin submits to the camera. At one stage, he accompanies her to a rehab centre, where she is knocked back. “There’s not enough beds”, Mark exclaims angrily of the poor public-health services available to addicts ready to quit, only to find themselves handballed around. Eventually, Erin is told that she will have to wait out the week for treatment – not the most optimistic of prospects. At this point, High or Dry becomes a contrast of subjects. Where Mark is a spontaneous personality and public performer, the reflective Erin has built herself a solitary life. “It’s far too easy to self-destruct when no one else is watching”, she says. Given the shape Higgs’ project has taken, he may well already understand this. While Erin perhaps leaves the most lasting image in High or Dry, Mark is foremost the film’s spokesman for memorable drug-addled anecdotes. One of the best he supplies involves the Public Housing gauntlet junkies run at the risk of being mugged by some of the indigenous inhabitants who await them in the elevators. This dangerous practice is especially prevalent on dole day – a date Mark knows he can enjoy a “taste”. (The present tense existence of an entire generation is summed up almost exclusively in the original cover art of the Sea Scouts’ Pattern Recognition.) Later on, Mark gives a sorrowful account of his musical talents at the piano. Heroin unfortunately doesn’t suffice for soul when compared with “Emily May” by Epic Soundtracks, another melancholiac drummer turned songwriter. Even so, Mark possesses talent, yet hardly any more than Rachael, who acquits herself equally well with a piece by Michael Nyman, after having flown under the radar as a creative energy until now. It’s the fickle use of information Higgs administers throughout High or Dry which makes the people on screen difficult to write off. Insofar as the overall process tends to reinforce their separation, it also insists on incompletion. In this regard, the film liberates as much as it imprisons. Is Mark’s lifestyle ultimately encouraged or prohibited by the presentation? High or Dry isn’t forthcoming with the answers, but it does provide some optimistic clues in the heartache. During the course of the film, Mark buys smack, fixes in front of camera and nods off. In short, he participates in a selection of so-called taboo activities. Still, as dramatic activities they don’t add up to much other than perhaps the crudest fragments of a life. To the degree that Higgs’ blurs his boundaries as filmmaker and friend, High or Dry may well yet embody a selfless gesture; it not only consecrates those fragments but sets in motion the process of picking them up.